The bright wooden decorative pieces which you have bought a month ago seem to lose its shine. If you have a closer look on the wooden pieces, you will come to know that termites are the reason behind your faded wooden items. If you tap on the wooden item, you will be shocked to see piles of dust of wood are falling off. Raising your eyebrows on seeing cavities and holes on the wallpaper is quite natural. How did the wallpaper on the wall get cavities and tiny holes? The pages of your favourite magazine have many holes and the words on the pages are missing out. If you notice all the aforementioned signs at your place, then you should contact the pest control operator right now. The signs which are mentioned above tell you that termites are slowly consuming your property. With the help of termite control Perth services, you can keep the possessions of your place intact. The termite controls will not let termites access in your zone. What will happen if you apply wrong termiticides on termite specie which is wrecking destruction in your possessions? You will not be able to eliminate the termite specie which is roaming around your property if you have no expertise on the pesticides designed for termites. Therefore, the termite control specialists of our pest agency will assist you in providing accurate knowledge on termiticides and on termite species. Get termite solutions in exact amount from the professionals to exterminate dampwood termites, drywood termites and subterranean termites. * The intricate mud tubes can be seen in close proximity to soil. The mud tubes are constructed of saliva and faeces. These mud tubes appear to be generally cylindrical and are brown in color. * In moisture-prone places, the nests of termites are seen. You might catch sight of mud tunnels on the pipes which are dripping with water. The sagging ceilings, floors and wall are the prominent signs of termite dwelling points. * Wings of termites or some dead termites can be seen fallen down on the floors and on other objects. * Hollow marks on the wooden materials will make you alert about termite infestation. How you can control the breeding of termites? Dump the temporary do-it-yourself tricks which will not sort out your termite hassles. 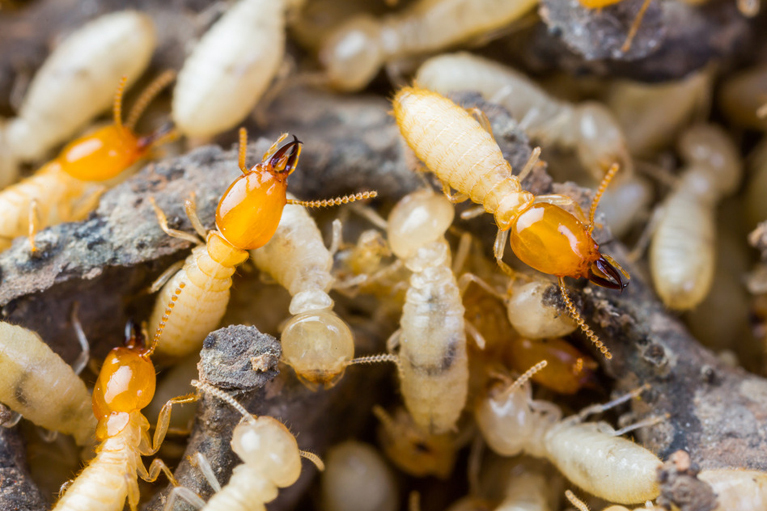 Termites can reproduce very fast; therefore, you need powerful termite extermination plans and a comprehensive termite inspection to avert termites from reproducing in your space. The termiticides and termite treatments used by our termite specialists will help as blockage which will not allow termites to erupt again in your territory. Get an annual termite inspection done from our termite-specialized pest guys to keep termites out forever.